Alyssa Mautz and the Chicago Red Stars struck first at Memorial Stadium on Wednesday night, but Megan Rapinoe and Seattle Reign FC found a way in the second half to pull out the 2-1 victory at home. Reign midfielder Christine Nairn nearly struck first in the 10th minute. Merritt Mathias carried the ball up the right wing before finding forward Nahomi Kawasumi near the end line. She found Nairn at the edge of the six-yard box, and Nairn was able to get just enough of a flick on the ball to try and redirect it past Chicago goalkeeper Alyssa Naeher. Naeher dove to her right and was able to palm it away for the save. Mautz was in the right place at the right time in the 41st minute to get the Red Stars on the board first. She cleaned up a Julie Ertz cross into the box after a bit of a scramble from Seattle goalkeeper Haley Kopmeyer and the Reign defense. In the second half, however, it was the pair of penalties from Rapinoe that ultimately decided the game. The first one came after Chicago Red Stars midfielder Taylor Comeau conceded a hand ball in the box. Rapinoe converted with her right foot, and the Reign’s comeback was underway. While Chicago might have accepted a point on the road in the middle of a difficult three-game stretch, Rapinoe’s second penalty in the 84th minute was a late blow. This time, Rapinoe drew her own penalty in the box from Chicago defender Casey Short. There’s no rest for the Red Stars. They’re off to Orlando, to face the Pride on Saturday at 5:00 p.m. ET. Their new neighbors on the table, the now-third place Portland Thorns, will be the next to enter Memorial Stadium and hope to take down the Reign. The Thorns are now only two points behind Chicago with their eye firmly on the No. 2 spot. Seattle and Portland will kick off Saturday night at 10:30 p.m. ET. Match ends, Seattle Reign 2, Chicago Red Stars 1. Second Half ends, Seattle Reign 2, Chicago Red Stars 1. Substitution, Seattle Reign. Maddie Bauer replaces Beverly Yanez. Corner, Chicago Red Stars. Conceded by Merritt Mathias. Goal! Seattle Reign 2, Chicago Red Stars 1. 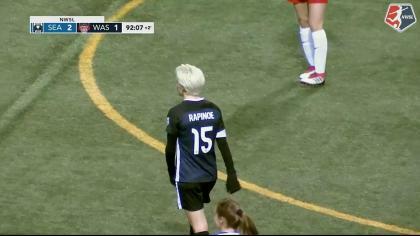 Megan Rapinoe (Seattle Reign) converts the penalty with a right footed shot to the high centre of the goal. Penalty Seattle Reign. Megan Rapinoe draws a foul in the penalty area. Penalty conceded by Casey Short (Chicago Red Stars) after a foul in the penalty area. Attempt missed. Katie Johnson (Seattle Reign) left footed shot from the right side of the box misses to the right. Attempt blocked. Katie Johnson (Seattle Reign) right footed shot from the right side of the box is blocked. Assisted by Beverly Yanez. Attempt missed. Beverly Yanez (Seattle Reign) header from the centre of the box misses to the left. Assisted by Megan Rapinoe with a cross following a corner. Corner, Seattle Reign. Conceded by Casey Short. Corner, Seattle Reign. Conceded by Arin Gilliland. Substitution, Seattle Reign. Kiersten Dallstream replaces Christine Nairn. Attempt missed. Julie Ertz (Chicago Red Stars) right footed shot from outside the box is too high. Assisted by Sofia Huerta with a headed pass. Hand ball by Katie Johnson (Seattle Reign). Attempt missed. Christine Nairn (Seattle Reign) left footed shot from outside the box is close, but misses the top left corner. Assisted by Katie Johnson. Substitution, Seattle Reign. Katie Johnson replaces Nahomi Kawasumi. Attempt saved. Megan Rapinoe (Seattle Reign) right footed shot from the right side of the box is saved in the bottom right corner. Assisted by Merritt Mathias. Carson Pickett (Seattle Reign) wins a free kick in the defensive half. Attempt missed. Christen Press (Chicago Red Stars) right footed shot from the centre of the box misses to the left. Assisted by Vanessa Di Bernardo with a cross. Attempt saved. Vanessa Di Bernardo (Chicago Red Stars) with an attempt from the left side of the six yard box is saved in the top centre of the goal. Assisted by Christen Press. Attempt missed. Megan Rapinoe (Seattle Reign) right footed shot from outside the box misses to the right following a corner. Corner, Seattle Reign. Conceded by Samantha Johnson. Attempt blocked. Lindsay Elston (Seattle Reign) right footed shot from outside the box is blocked. Goal! Seattle Reign 1, Chicago Red Stars 1. Megan Rapinoe (Seattle Reign) converts the penalty with a right footed shot to the high centre of the goal. Penalty conceded by Taylor Comeau (Chicago Red Stars) with a hand ball in the penalty area. Attempt blocked. Lindsay Elston (Seattle Reign) header from the centre of the box is blocked. Assisted by Christine Nairn with a cross. Offside, Seattle Reign. Lindsay Elston tries a through ball, but Merritt Mathias is caught offside. Attempt missed. Sofia Huerta (Chicago Red Stars) right footed shot from the right side of the box misses to the left. Delay in match Christen Press (Chicago Red Stars) because of an injury. Second Half begins Seattle Reign 0, Chicago Red Stars 1. First Half ends, Seattle Reign 0, Chicago Red Stars 1. Attempt missed. 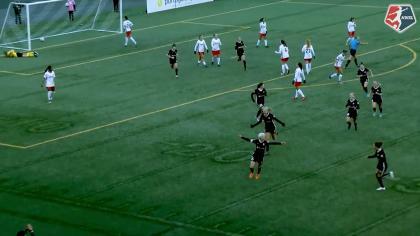 Jessica Fishlock (Seattle Reign) right footed shot from outside the box is just a bit too high. Assisted by Nahomi Kawasumi. Corner, Seattle Reign. Conceded by Katie Naughton. Offside, Seattle Reign. Merritt Mathias tries a through ball, but Nahomi Kawasumi is caught offside. Goal! Seattle Reign 0, Chicago Red Stars 1. Alyssa Mautz (Chicago Red Stars) right footed shot from the left side of the six yard box to the bottom left corner. Assisted by Julie Ertz. Attempt missed. Julie Ertz (Chicago Red Stars) right footed shot from the centre of the box misses to the left. Attempt blocked. Christen Press (Chicago Red Stars) right footed shot from outside the box is blocked. Assisted by Julie Ertz. Corner, Seattle Reign. Conceded by Vanessa Di Bernardo. Attempt blocked. Beverly Yanez (Seattle Reign) left footed shot from the centre of the box is blocked. Assisted by Lindsay Elston with a cross. Corner, Chicago Red Stars. Conceded by Rebekah Stott. Attempt blocked. Christen Press (Chicago Red Stars) left footed shot from outside the box is blocked. Attempt missed. Julie Ertz (Chicago Red Stars) right footed shot from the centre of the box is close, but misses to the right. Arin Gilliland (Chicago Red Stars) wins a free kick in the attacking half. Attempt blocked. Vanessa Di Bernardo (Chicago Red Stars) right footed shot from the centre of the box is blocked. Attempt missed. Nahomi Kawasumi (Seattle Reign) right footed shot from the centre of the box is close, but misses to the right. Assisted by Beverly Yanez. Attempt saved. Vanessa Di Bernardo (Chicago Red Stars) left footed shot from the right side of the box is saved in the bottom right corner. Assisted by Christen Press. Attempt blocked. Christen Press (Chicago Red Stars) right footed shot from outside the box is blocked. Corner, Chicago Red Stars. Conceded by Christine Nairn. Attempt blocked. Arin Gilliland (Chicago Red Stars) right footed shot from the centre of the box is blocked. Attempt saved. Christine Nairn (Seattle Reign) left footed shot from the centre of the box is saved in the centre of the goal. Assisted by Nahomi Kawasumi with a cross. Corner, Chicago Red Stars. Conceded by Kristen McNabb.